15 of the coolest Arcades you'll ever see! Arcades have been popular in the U.S. since the 1900s. Back in the good old days an Arcade was called an Amusement Arcade and was most often a Penny Arcade filled with coin-operated games that took your pennies and gave you back some type of amusement in the form of your fortune, romantic advice or pictures of exotic people and places. Over the years more sophisticated electronic entertainment was added such as pinball games and video games where players pitted themselves against the machines for the high score and coveted top player position. With time and more players tournaments sprang up that let people compete against each other in timed events. Step right up and find fun, whimsy and a bit of nostalgia at these unique arcades and dens of activity. At the Timeline be ready to step into the past where you will "enter an epic world of classic arcade games" standing alongside all the current favorites. They promise something to delight everyone with more than 140 games to get your hands on. Party like it's 1979 with Asteroids and Donkey Kong and when you're ready to get out into the light, take advantage of all Hanover, PA has to offer for sightseeing, shopping and farm-fresh good eats. The Pinball Hall of Fame may be called a museum, but it's a working parlor of fun for anyone with fond memories of hours spent battling the forces of good and evil inside pinball machines and arcade games. Located in the land of chance, count on dropping some quarters you won't be getting back, but at least you can claim the title of high score, at least until the next sixth grader comes along. At Yestercades, count on classic pinball machines at every turn. They claim a wide variety of arcade games, pinball machines and "home consoles for your gaming pleasure." Start in 1979 with Midway's "Galaxian" and working your way through to the late 90s with games like Marvel VS Capcom 2 and World Series '99. Sports fans, space fans, fans of fun â€¦ you won't escape Yestercades without a feeling of nostalgia along with pent up energy in need of release! PAPA stands for Professional and Amateur Pinball Association and they are an organization dedicated to preserving traditions while encouraging competition. They host the annual World Pinball Championships and the Pinburgh Match-Play Championship, which is an event where players compete in multiple rounds over the course of two days. At their headquarters just outside of Pittsburgh they are the caretakers of more than 400 pinball machines, waiting to come to life for a pinball wizard. If you have ever been to Brooklyn, you will know they do things a little differently. In a good way. Barcade is no exception. A mixture of the past (classic video games) and the present (craft beers on tap), you can indulge all your senses any night of the week and be hard pressed to run out of something new to try. The best part: The list of games is even longer than the list of micro brews. Star Worlds entreats you to "play today the games you miss from yesterday" and they have stayed true to their mission for the past 30 years. What started as an obsession for one little boy turned into a business and a destination for people in the local communities to come with their kids to play the games they played as kids. Ground Kontrol is a classic arcade where you will find more than 90 arcade games from the past 40 years. Lit like a high school dance, you'll feel like you just emerged from the hot tub time machine to find yourself in the arcade of your sophomore dreams. Grown ups will appreciate the full-service bar and their new monthly "Killer Queen Arcade League Night" has turned into a popular tournament where players are randomly assigned to teams, so you get to meet new people and learn new skills while you play some of your favorite games. The 1 Up Arcade and Bar in Denver has a "solid selection of 40 oz. bottles of malt liquor," but don't let the "Bar" part of their name fool you about their priorities. The 1 Up has more than 45 classic arcade games along with Skee Ball, Giant Genga and 16 pinball machines. Their location in downtown Denver is ideal for residents and visitors and their proximity to Coors Field, the home of the Colorado Rockies, makes them a fun stop before or after a game. Marvin's Marvelous Mechanical Museum is more than a museum, it's a piece of history lovingly preserved by Marvin whose impressive collection of vintage coin operated machines landed his Mechanical Museum on the World Almanac's list of the most unusual museums in the U.S. Marvin's is also a place you can drop some quarters for a few hours of fun and if you are looking for a unique party space, Marvin's does birthdays! Pay to play all day at the Galloping Ghost Arcade. 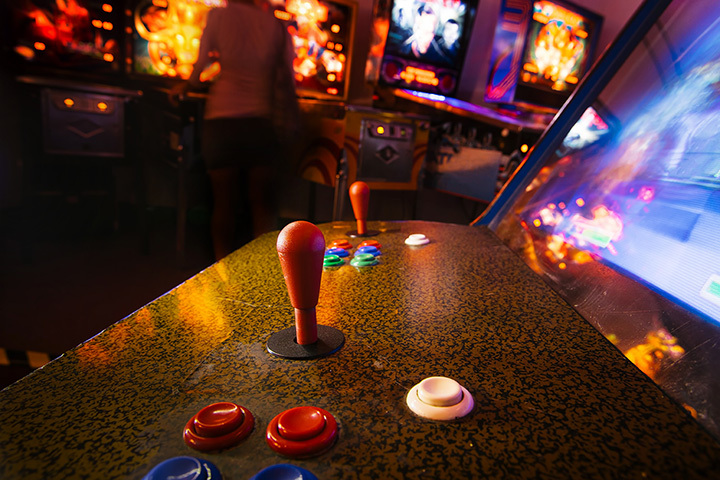 You will need all day to try your hand at the more than 440 games at the largest video arcade in the U.S. and one of the largest arcades in the world! Galloping Ghost is not stuck in the past (not that there's anything wrong with that). They have some of the newest and coolest games and they also boast more than 180 World Records that have been set at their location. Marty's Playland bills itself as one of the largest and most nostalgic arcades and its location on the Maryland shore adds to its charm. Marty's offers immediate gratification in the form of redemption games designed to appeal to all ages that let you trade your coupons and tokens for prizes. The arcade has been around since the 1940s in Ocean City, a place that attracts visitors year-round and especially in the summer when the boardwalk beckons and strollers can stop into Marty's for advice from a vintage fortune teller or a game of Skee Ball. At Tornado Terry's the focus in on keeping it simple, affordable and fun. They have two play zones, one where you purchase tokens and win candy or tickets that can be redeemed for prizes and one area where a flat fee lets you play more than 70 games, so you don't have to keep reaching back into your pocket for more money. You can also book a party at Tornado Terry's. Funspot holds the distinction of having been named the largest arcade in the world by Guinness World Records in 2008. That's because they have more than 600 games, half of which are arcade games. Add to that a bowling center, miniature golf and cash bingo games and you can guess why they call it Funspot. The operation was started by Bob Lawton in 1952 who still shows up every day to make sure Funspot remains a spot for family fun. Playland Arcade on the Santa Monica Pier in California wants you to think of it as the "second happiest place on Earth." Playland has been making people happy since it opened in 1950 with a combination of games and prizes for the young and young at heart. The Santa Monica Pier is a destination in itself, but combine a walk on the boardwalk with a visit to Playland and you have a recipe for a happy day. Located on Fisherman's Wharf, the Musee Mechanique has been family owned since 1933 and is one of the "world's largest privately owned collections of coin-operated mechanical musical instruments and antique arcade machines" that you can play! You never have to pay to enter, and you don't have to play, but more than one person has been moved to drop a coin or two in, just to see what the game will do!